I was expecting our comfort stop to be someplace simple - a bathroom, maybe a cafe, with a small area to pick up a souvenir or two. Instead, J and I were dropped off on one side of the sprawling Hong Ngoc complex, with instructions to get back on the bus 20 minutes later, at the other end of the building. 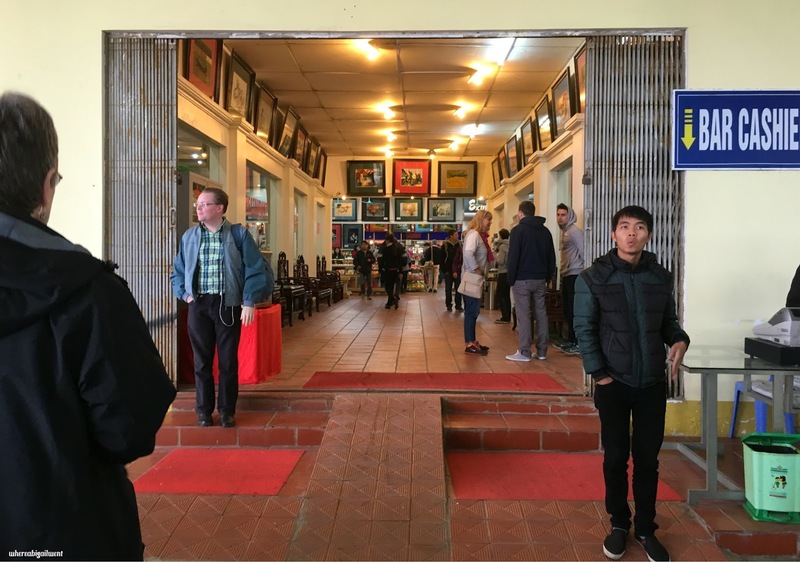 The space is stuffed to the gills with all manner of Vietnamese crafts and produce you can purchase, from intricate embroidery art, to jewelry and even weasel/civet cat coffee (Vietnam is, surprisingly, the second largest coffee producer in the world. Here, the beans that have been eaten and passed out by these animals are highly prized for their more, uh, robust flavour). It's also savvily laid out - the both of us had to wend our way through what felt like a maze of merchandise before we managed to find the restaurant all the way in the back. You had to admire how well thought-out the entire enterprise was. The place was obviously a tourist trap, with a majority of the handicrafts going for at least twice the asking price of what you might find in the heart of Hanoi, but people were still buying. The most egregious price hikes seemed to be on snacks, yet we saw a guy quite happily fork over $30 for a few packets of chips. Thankfully, the restaurant's prices weren't outlandish. J wanted soup for breakfast, and I felt like having noodles, so we split a bowl of pork pho. Trusting Google Maps is a mistake I've made once too often. 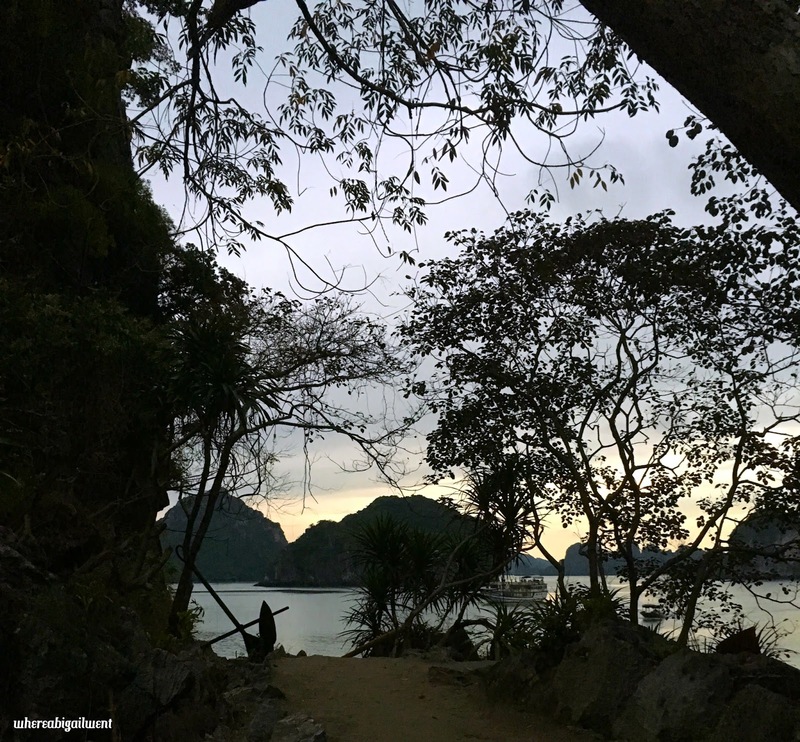 They say it's a three hour drive to cover the 170 km (Or about 107 miles) to get from Hanoi to Halong Bay. What they don't do, is factor in the traffic (So much traffic! ), which in this case caused our journey to drag out far longer. 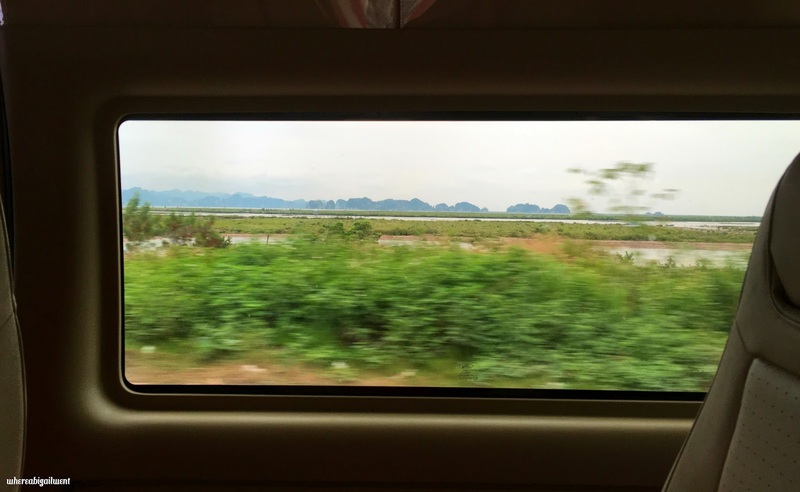 During the first two hours, Quy (The guide who picked us up from Hanoi) gave the whole van a crash course in Vietnamese pronunciation, and a brief primer on Hanoi, Halong Bay, and the towns we were passing in between. After our brief stop, everyone save the driver began nodding off. For me, the rest of the journey was a blur of the flashes of buildings and countryside that greeted me whenever I drifted out of sleep. 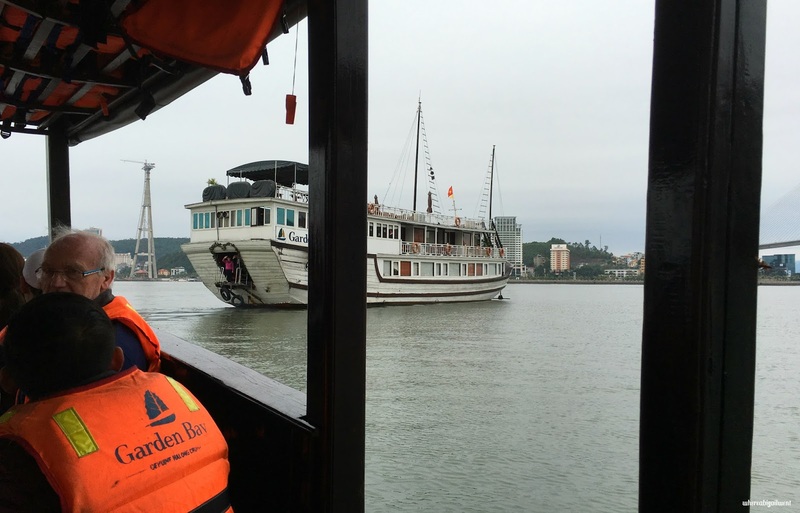 We arrived at Hon Gai Harbour almost five hours after leaving Hanoi, so imagine our surprise when we weren't rushed straight to the boat, but ushered instead to the Tonkin Cruises waiting area. 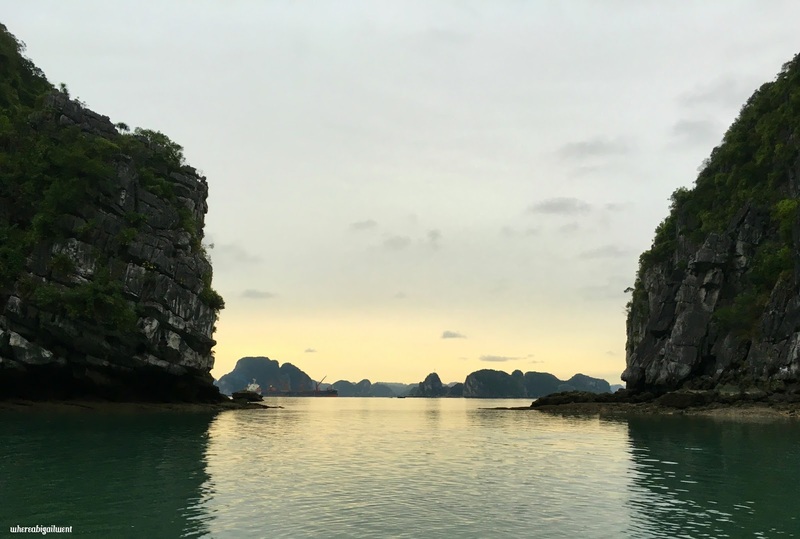 Halong Bay attracts over 2.5 million visitors a year, and the boats plying the Bay and its surrounds run pretty much non-stop all year round (Save during typhoon season from August to October, when trips are sometimes cancelled in deference to the weather). The turnaround time for each boat is therefore remarkably brief. The previous batch of guests had only just departed, and a little more time was needed to straighten out the boat for our arrival. It was definitely a slightly chaotic situation, but the guides made the best of it. 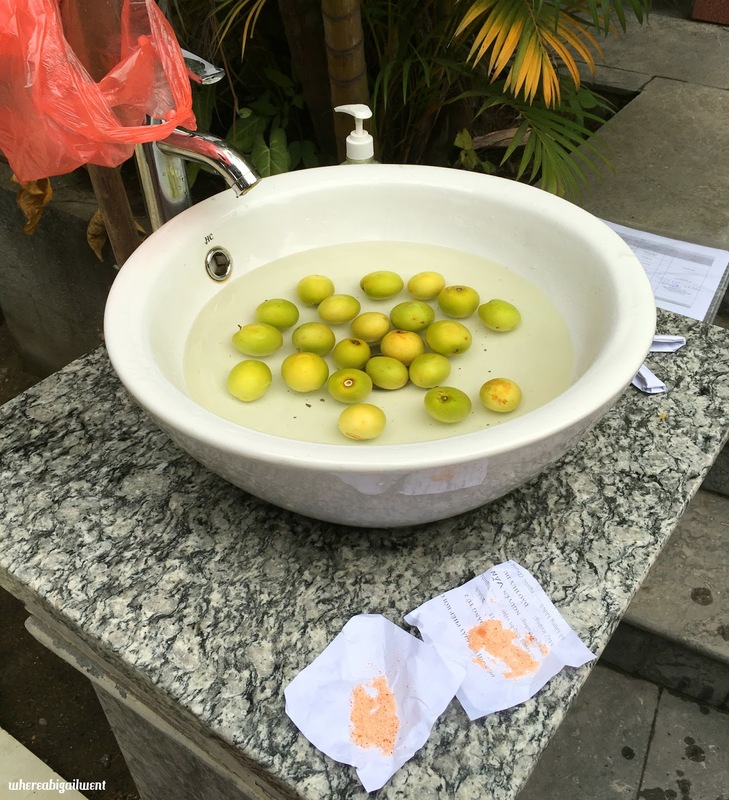 One of them had brought along a big bag of Vietnamese apples in anticipation of this very situation, and invited all of us to try some with chilli salt while we waited. 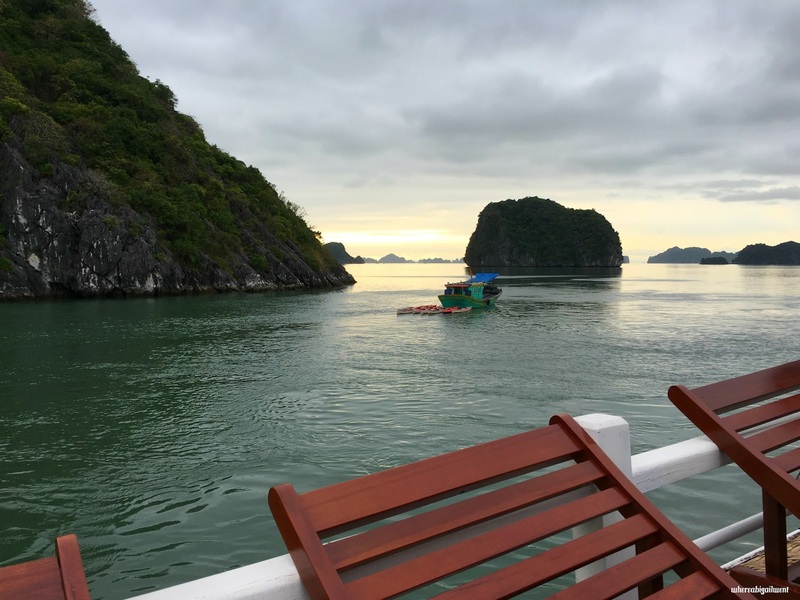 Hundreds of cruises sail around Halong Bay each day, and picking the right boat involved wading into the murky waters of online ratings. We found reviews for Garden Bay Cruises, their sister boat the Marguerite, and their parent company Tonkin Cruises scattered all over TripAdvisor. It seemed a little shady, but the general consensus showed that people were reasonably happy with their time on board on these boats, so onto my shortlist it went. The very nice saleslady from Tonkin Cruises was able to offer us a Balcony Room on Garden Bay at a lower price point than what we were quoted for a basic cabin everywhere else. After we cheekily asked if that was the best possible price, she also threw in a few perks, including a free massage and bottle of wine. We were sold. We were greeted with warm smiles and hot cups of cinnamon tea when we were finally transferred onto Garden Bay 02. 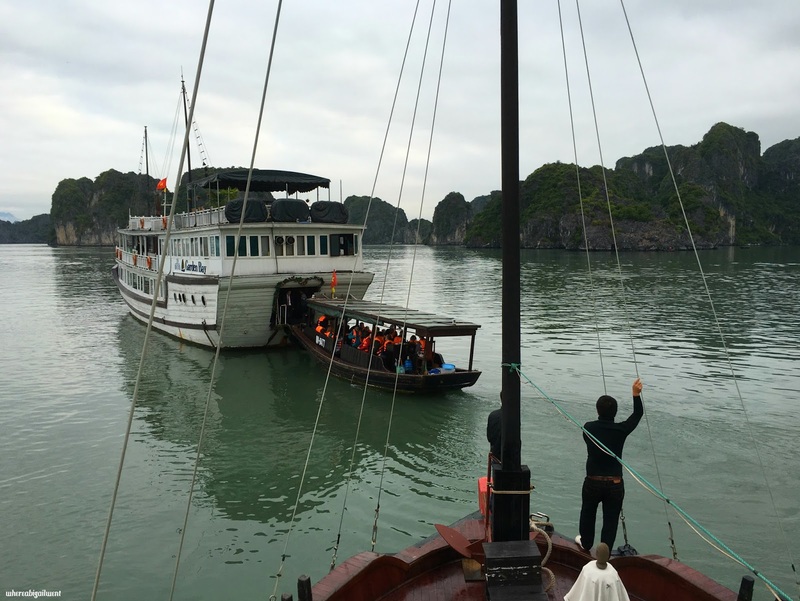 The boat is one of the newer ones in their fleet (It was built in Halong in 2014), but still modeled after a traditional Vietnamese junk for a more authentic Halong cruise experience. 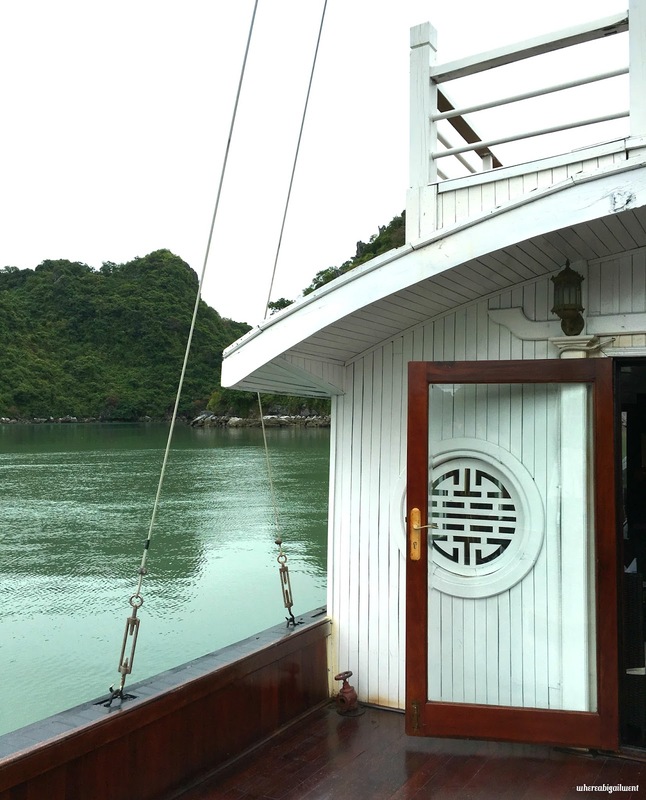 As the boat slowly made its way towards Bai Tu Long Bay (To the northeast of Halong Bay), we settled in for a lavish and quite delicious multi-course lunch. Garden Bay 02 has just 11 guest cabins on board, and feels really cozy as a result. 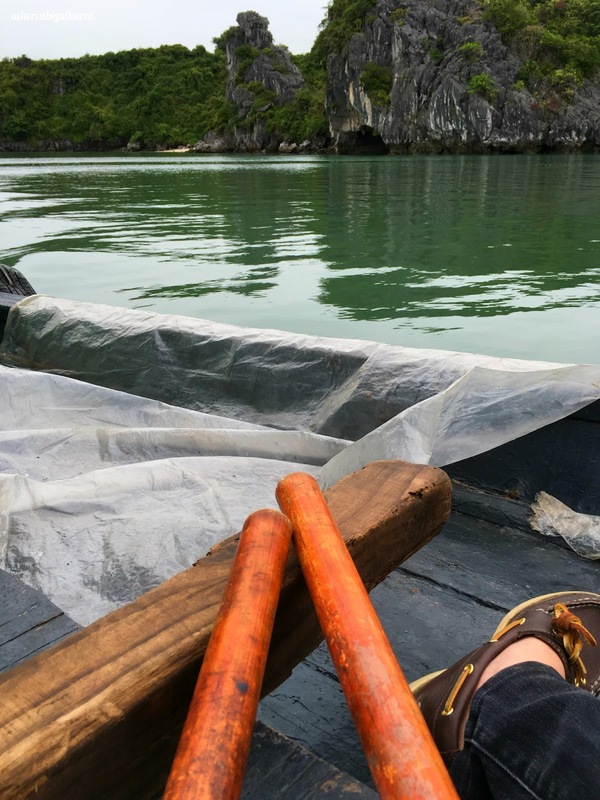 Since it's a medium-sized junk, we were able to sail down a less crowded route towards Bai Tu Long Bay, which is still considered a destination that's off the beaten track. 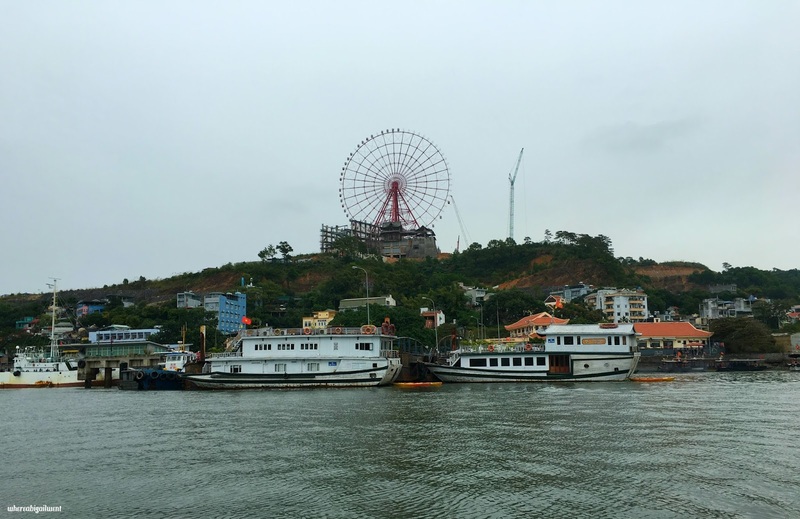 As we cruised serenely down the waterways, it almost felt as though we were the only people around, save for the odd fishing vessels that weaved around the islets stretching as far as the eye could see. 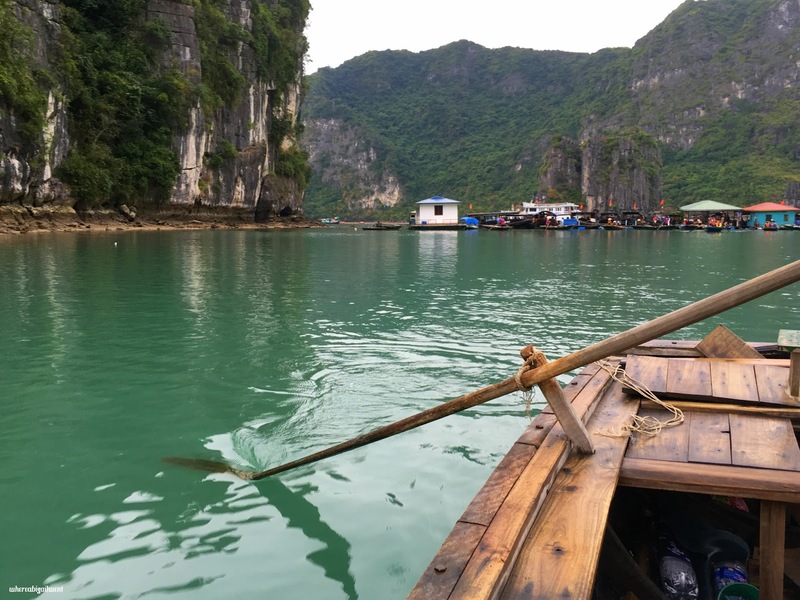 The day's main activity was being rowed around a floating fishing village called Vung Vieng, located in the heart of Bai Tu Long Bay, around 24 km or 15 miles away from the mainland. 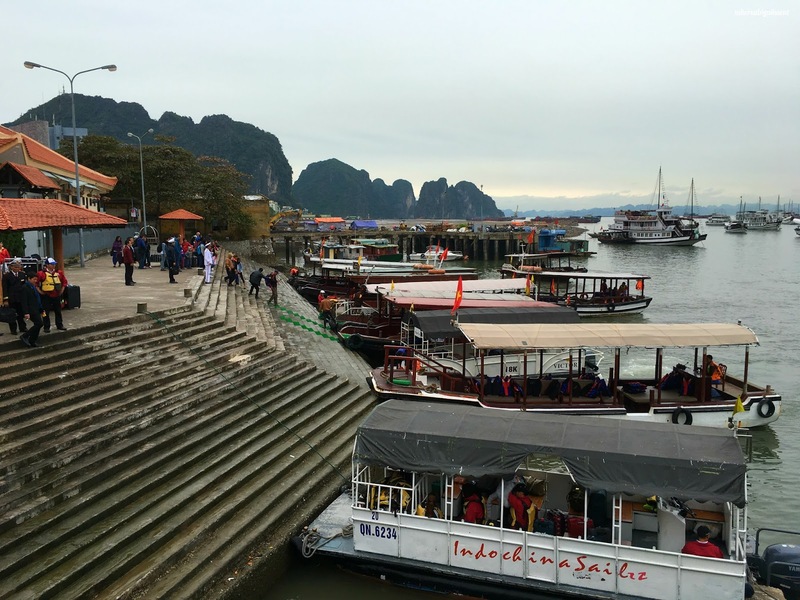 When our transfer tender reached the floating platform that was the start and end point of the traditional rowboat experience, we were greeted by the cacophony of scores of other tourists, and the bustle of people getting on and off the boats. 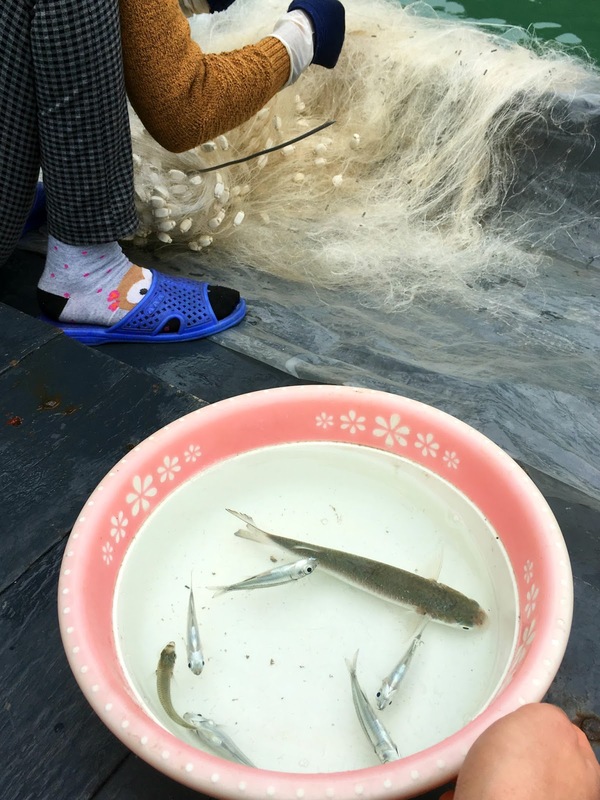 Our "fishing village visit" wasn't going to give us an in-depth look into the lives of the people who resided there, rather a quick sightsee around the islets that encircled the floating community. According to legend, many millennia ago, the ancient Vietnamese people were being threatened by invaders who were attacking from the north, via the sea. Moved by the plight of the near-defenceless people, a mother dragon and her children came down from the heavens to help them. 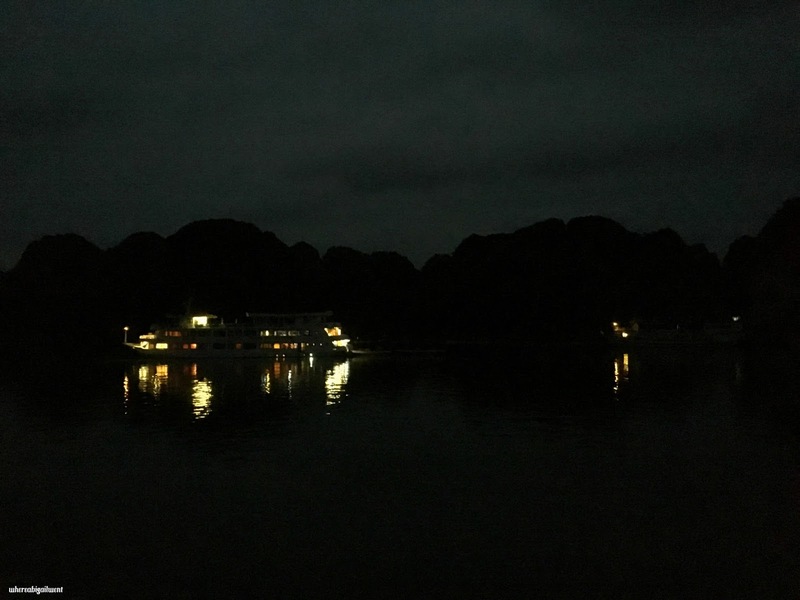 The site where she appeared became known as Ha Long, which means "Descending Dragon", while her children appeared over present day Bai Tu Long, "Offspring of the Dragon". 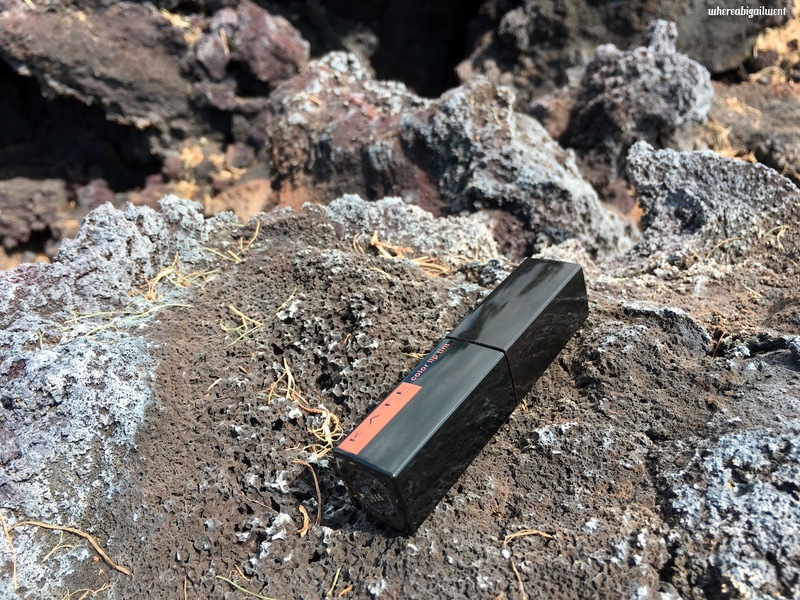 To ward off the invaders, they spat out fire and jade, which turned into the islands and islets that you see today. 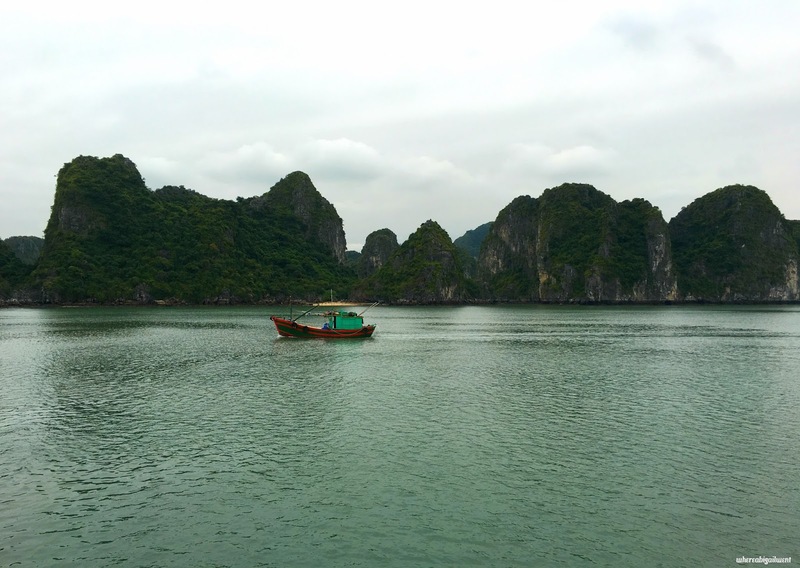 The invading ships were dashed against the maze of limestone, and the Vietnamese people saved. It's a lovely little myth that really speaks to the almost other-worldly nature of the environment here. 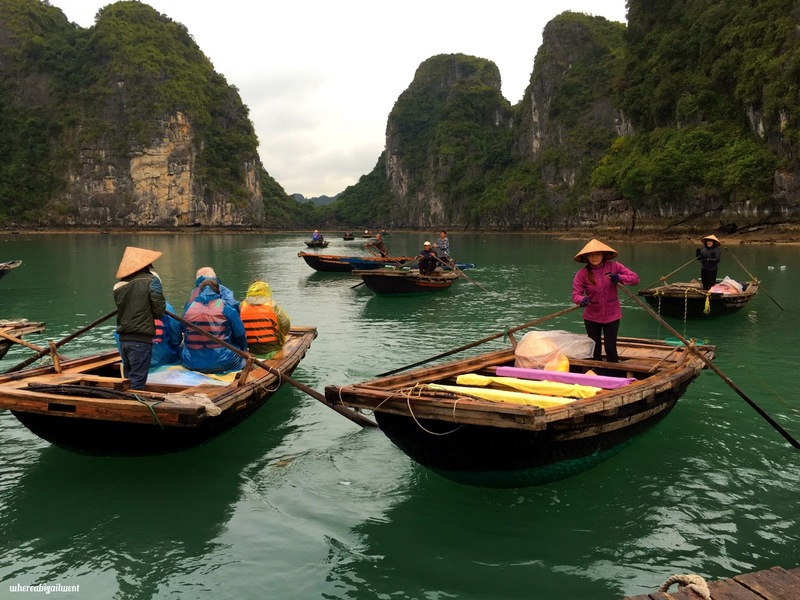 For its outstanding beauty, the central bits of Halong Bay was designated a UNESCO World Heritage Site in 1994. 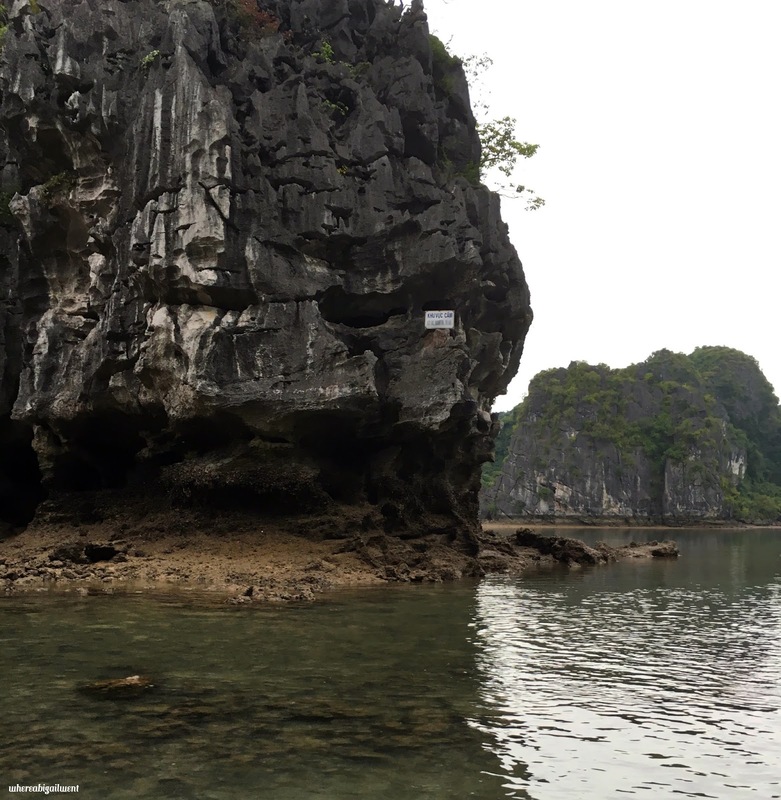 This listing was updated to include a wider area in 2000 after the committee decided to also recognize the geological significance of the karst. 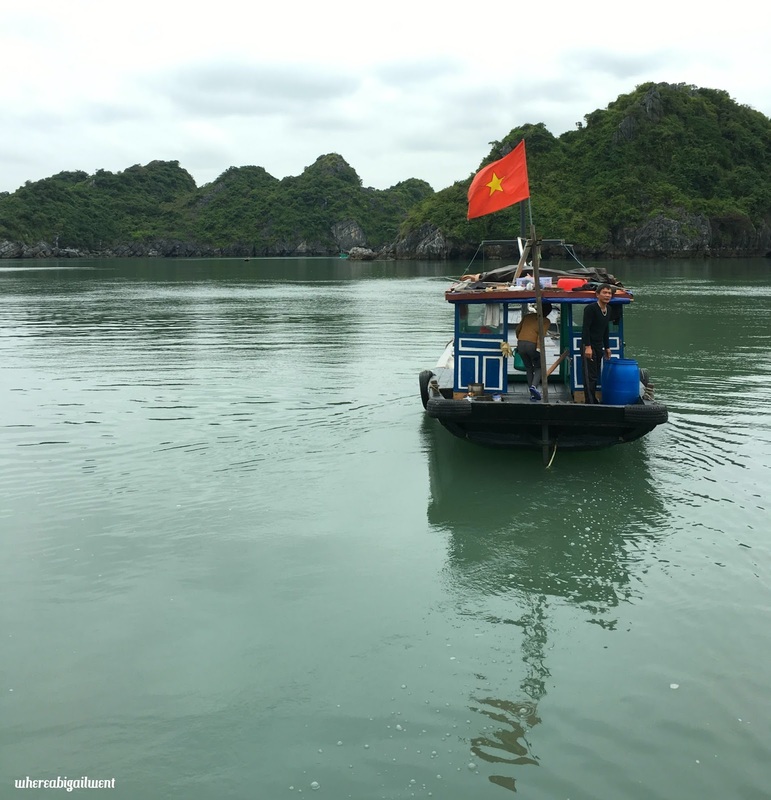 Maintaining the integrity of the site is an important issue, not just for the Bay to retain its UNESCO designated status, but to protect an area that's been a part of Vietnamese heritage for thousands of years. 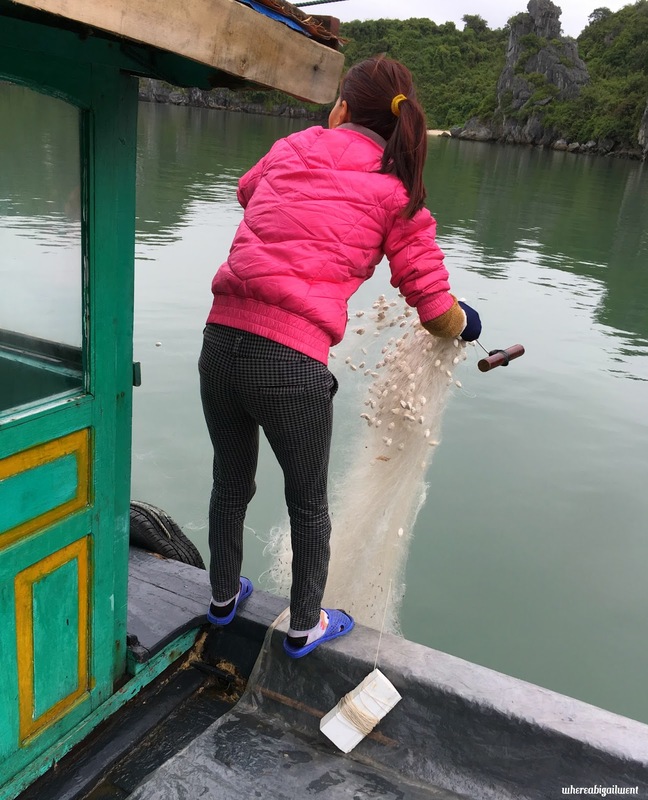 A few years back, the bays were apparently plagued by a scourge of litter and all kinds of dubious waste, as the villagers of the various fishing communities in Halong and some tourists were all effectively treating the sea as a dumping ground. After a concerted effort was made by some local volunteers to clean up the area and educate visitors and residents alike, the water is now remarkably clear and flotsam-free. Sea hawks circled overhead as we pushed off the platform and began our circuit. From our balcony, the karst peaks of the bay rising out of the emerald green waters were a majestic but distant sight. 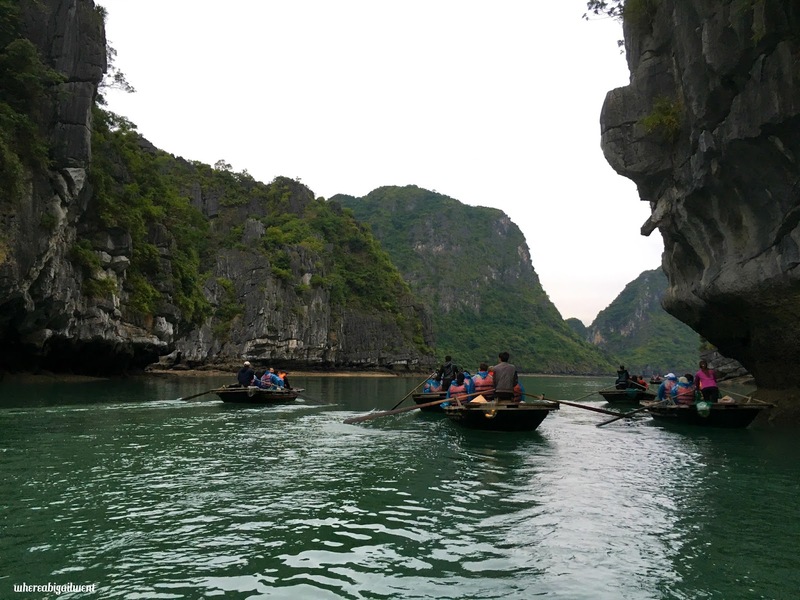 On our little row boat, we were able to get up-close to the limestone pillars, in a way that felt strangely intimate. Each dizzyingly precipitous cliff face and every interesting cavern was laid out right before our eyes. 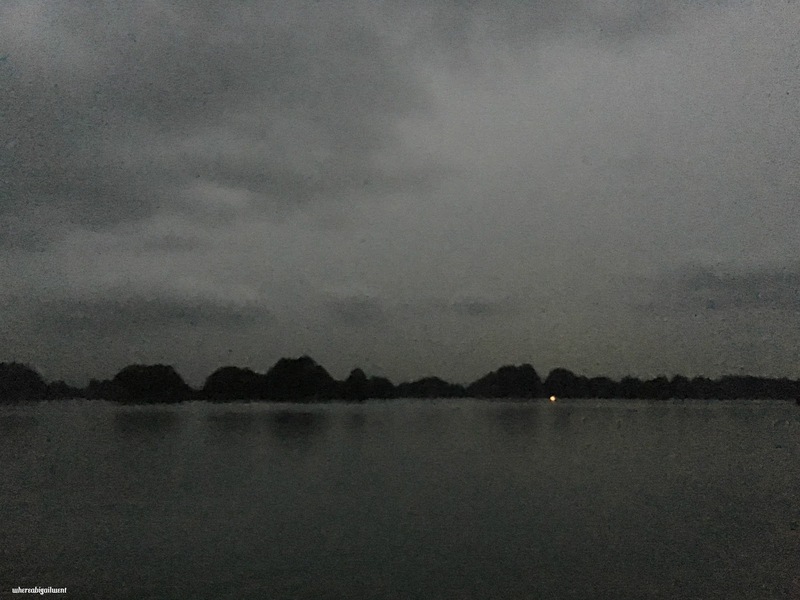 We were in Vietnam during cloudy season, which cast everything around us in a thick grey pallor, but even then there was no mistaking how verdant the islets were. As we glided round yet another bend, the vibrant fishing village finally came into view. Nestled in the heart of a cluster of islands, the water here is remarkably calm, and the houses hardly seemed to bob at all. All the houses were silent. It looked as though the entire fishing village had taken to rowing tourists about after settling the day's catch. Some of the houses had numbers painted on the side, which made us wonder if mail gets delivered here, and whether the sign we'd passed that was tacked on to the side of an islet was a street name for ease of navigation. 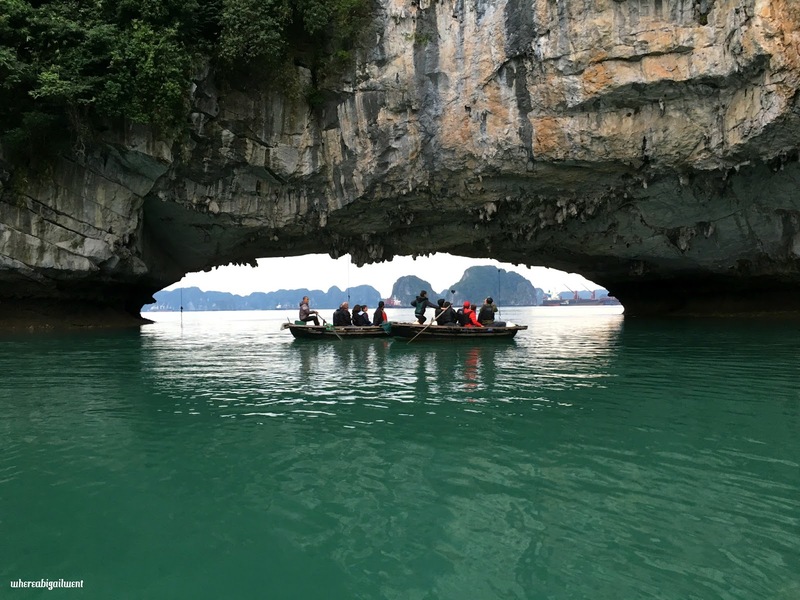 One of the highlights of our boat tour was the main village "gate", an archway through one of the limestone pillars that had been created by thousands of years of erosion. Beyond it lay a natural harbour, and then the open sea. Our oars were manned by a petite and stoic lady, who rowed us right under the arch, a little further than everyone else seemed to have gone. After we were done taking pictures and gawping at the stalactites overhead, she swiftly and smoothly turned the boat around, and off we were. 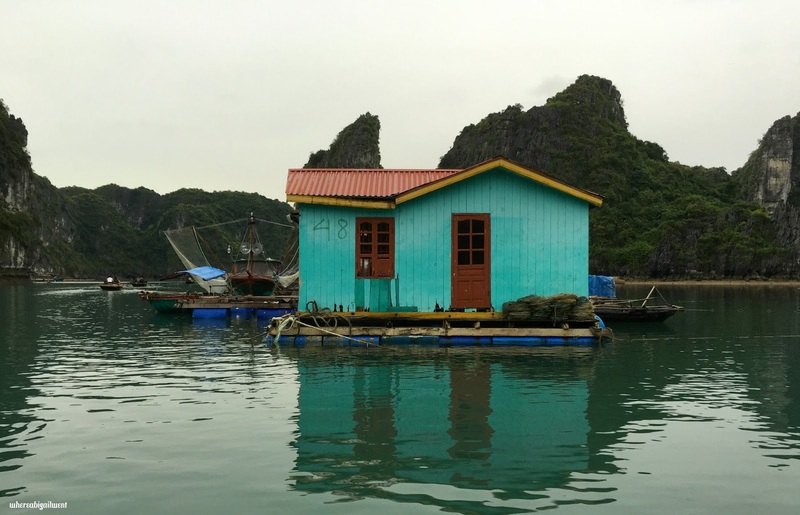 There are almost 2000 limestone structures in Halong Bay, of which less than half are named. Most of these have been named after the animals they vaguely resemble, in an attempt to differentiate one rock from the next. It's actually quite difficult to think of suitable monikers. We tried our hand at naming a few, and after squinting very hard at the formations we passed, we managed to decide on "Camel Island" for one, "Rhino Island" for another, and "Pride Rock" for the islet with a cliff face that looked vaguely like cloud-Mufasa from The Lion King. Our attempts quickly descended into "That Rock With All The Orange Stuff" and "The Rock Next To That One", after which we gave up and admired the sunset. Some of our cruisemates were overwhelmed by the day's hard travel, and were ferried directly back to the big boat after the village tour. 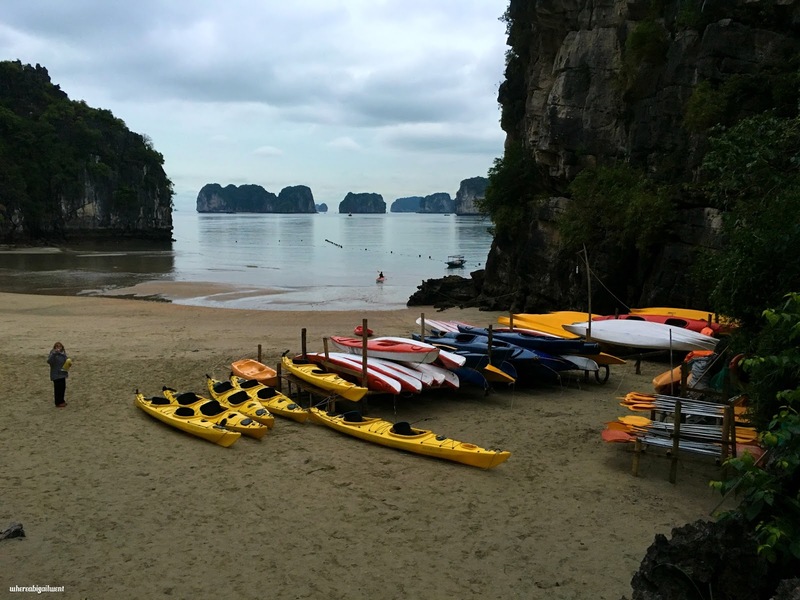 We stayed on the tender, which took us to join the people who'd decided to spend their afternoon more strenuously by kayaking and swimming around the private Ban Chan beach. The water was a little too chilly to splash around in, so J wrote his name in the sand and ran around the beach. I moved at a far more sedate pace. At dusk, the landscape seems even more magical, until it's slowly swallowed by the night. As we cruised to the peaceful Cong Do area to dock overnight, the cruise staff taught us all how to make traditional spring rolls. 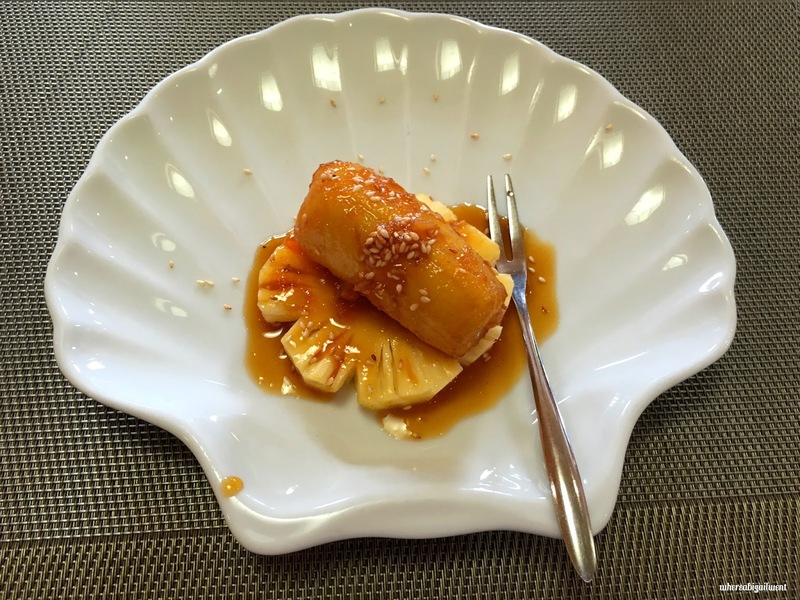 The trick is to ensure the rice paper is just the right amount of moist. We achieved this by gently pressing the sheets onto a mildly damp towel, as dipping them directly into water would make them fall apart, or become too sticky. I was the envy of all the women (and some of the men), because J turned out to have the best rolling skills. The spring rolls he made were so good, he was enlisted to help finish up the rest of the job. Mine weren't deformed, but paled in comparison, so I got to sit back with a Pina Colada in hand. 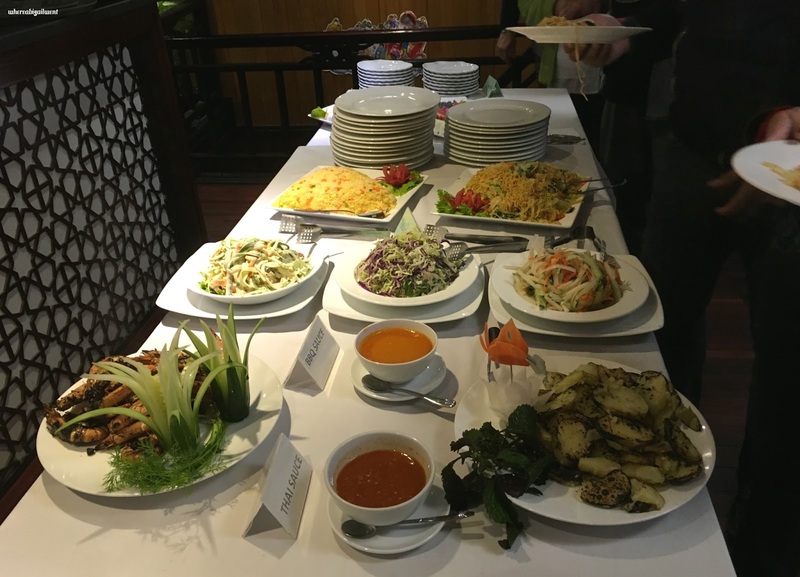 We feasted that night, not just on the spring rolls we helped to make (Which were deep fried to perfection in the kitchen), but also an array of salads and barbecued meats. The music selection was a little hit and miss, but we had excellent company over the dinner table, which more than made up for it. Some boats have a reputation for loud parties, but the only after-dinner activities on the Garden Bay 02 was squid fishing, which suited us just fine. Feeling a little heavy from dinner, we decided to take a quick nap. Unfortunately, my ability to disable an alarm in my sleep is getting a little too good, so we only work up early the next morning. Turned out to be a blessing in disguise - after the first tiny squid was hauled up, the rest of the squid wised up. The squid fishers spent the next hour feeling increasingly despondent. Since we were up at 5.30 in the morning, we decided to head up to the deck to see the sunrise once we saw the sky lighten up some through our cabin window. After shivering in the cold for 15 minutes, we realized that the clouds were too thick, and all we'd witness would be varying shades of grey. So, like any other sensible person would, we went back to bed. Kien told us at dinner the evening before that we were getting upgraded to Tonkin Cruises' newest luxury boat ("You'll have a jacuzzi in your bathroom!") for our second night, so once breakfast was through, we packed up our things to take along with us. Like all the other cruises, Garden Bay 02 was going to ferry the one-nighters back to the mainland and pick up a new batch of guests, and this was the last we saw of it for the rest of our journey. At 8.30 am sharp, we were transferred off the main boat and over to the day boat that would take us on an excursion to the outer islands. We swung over to Garden Bay 01 to pick up the rest of our day-tour group, Italian honeymooners and a group of Indonesian families who came armed with all manner of snacks and a really sweet set of speakers. One of the fathers had been appointed head DJ, and he made sure that our adventures were accompanied by an appropriate soundtrack. 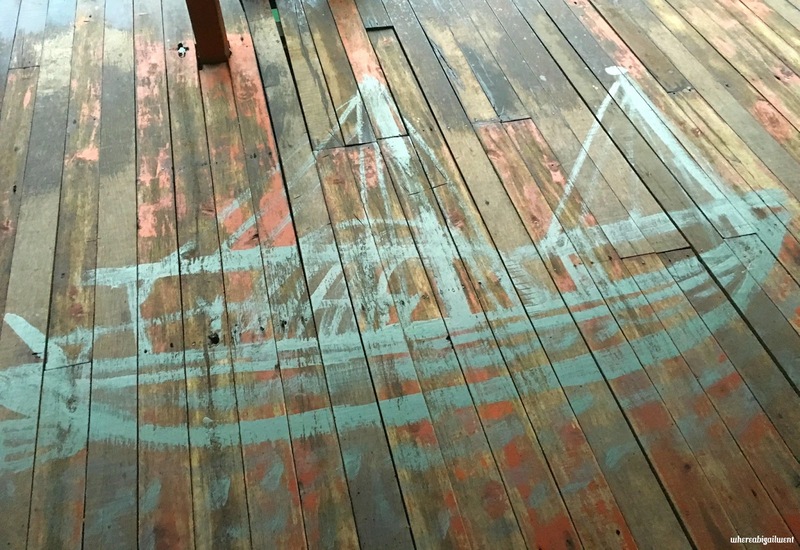 The children stayed downstairs to talk football and the latest phone games, while us adults ended up having an impromptu dance party (largely fuelled by the strong coffee served on-board) on the upper deck, in between bouts of sightseeing. Once the day boat made its way to the quiet Cap La area, we were divvied up into the two traditional fishing boats that greeted us there. 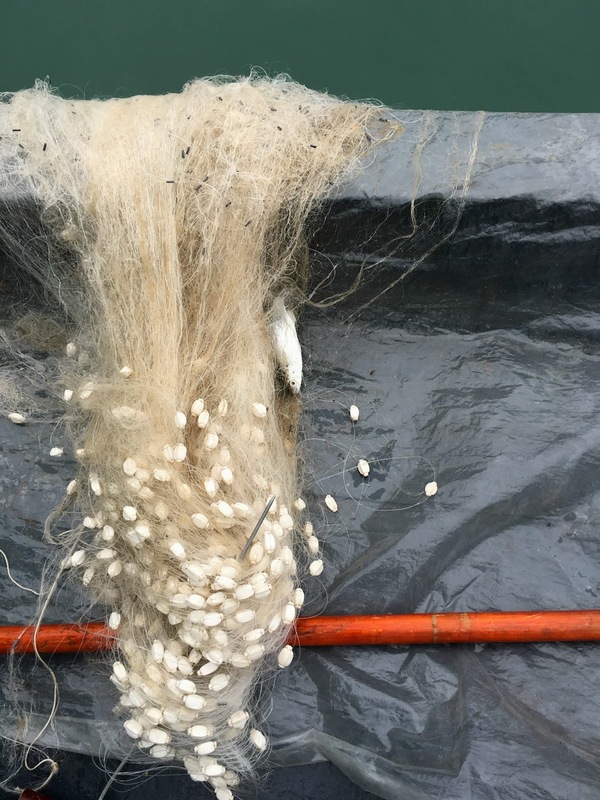 The traditional fishing technique that we were introduced to was gillnetting, using a very narrow but extremely fine net. 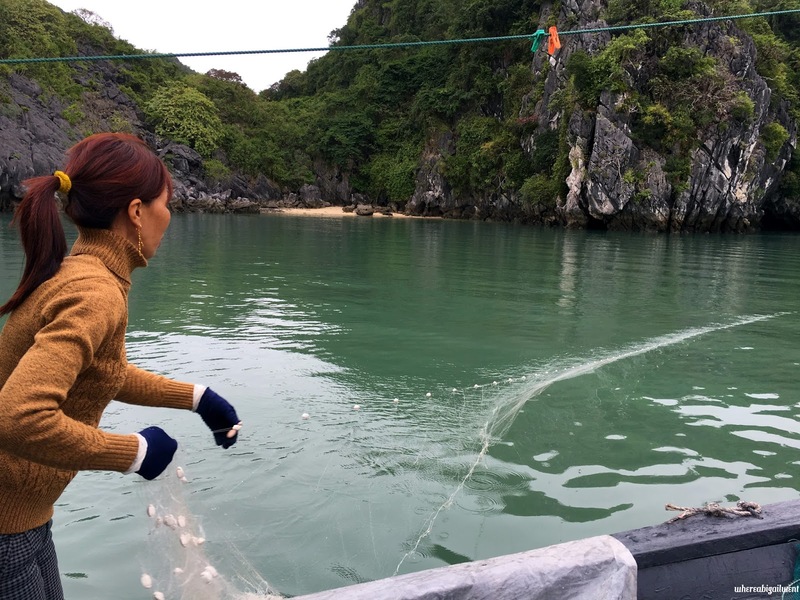 Once our fisher(wo)man scoped out a spot, she began casting the net bit by bit into the water, instructing the boatman to make a turn at one point, so the entire net was set out in a semicircle. Then, our work began. She laid out a slab of wood on the deck, and handed each of us a pair of pretty solid wooden sticks before demonstrating how we needed to viciously hit the plank in front of us. All those weeks of speedboxing for a solid minute during Muay Thai paid off! I was able to drum quite vigorously for most of the two passes we made around the net. 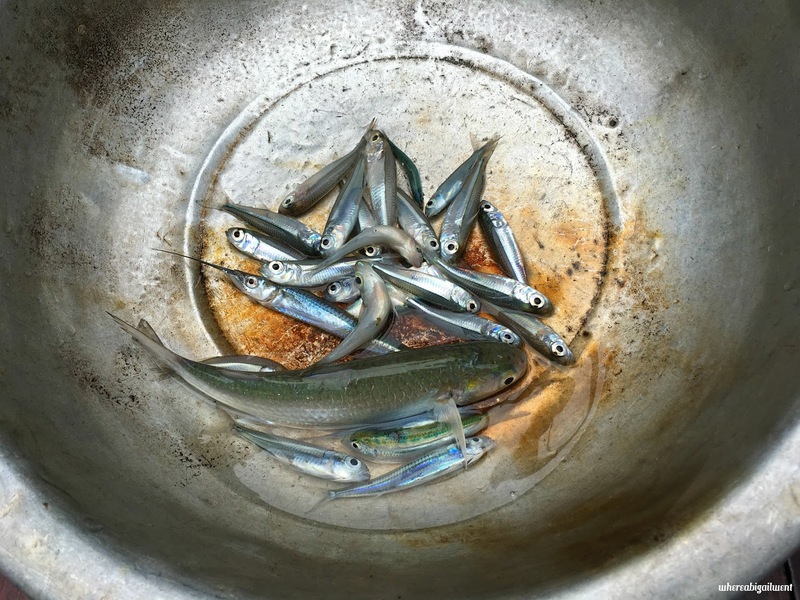 We'd been promised that every fishing tour brings in a catch, so while the net was being hauled back on board, we were expecting to be inundated with decently-sized fish that the kitchen could fry up for lunch. Unfortunately, our first attempt yielded just one silverfish, who looked quite surprised to be in this predicament. One fish wasn't going to feed all of us without a miracle involved, so they ended up driving the boat out to different waters in hope for a better catch. This time, I drummed till my arms felt like they were going to fall off. We netted more silverfish this time, but all of them were tiny, and immediately gave up on life. There are supposed to be over 200 different types of fish in the waters of the bay, which is teeming with wildlife. The islands are home to not just hawks, but also lizards, monkeys, and even antelope. The Bay is also home to over 450 different species of mollusc. Sadly, because of an increased tourist presence, seagrass beds have been cleared to make way for more boats, so you see a lot fewer dugong than there used to be. There were also once pods of dolphins and lots of sharks in the bay, but after decades of overfishing, these predators have since moved further out to sea. Initially, we thought our haul of nine fish was meagre, but we ended up ahead of the other boat, who managed even fewer. On the bright side, the kitchen was already well-stocked, and our catch of the day (or lack thereof) didn't affect the menu they had planned for us. After so much excitement, I was hopped up on adrenaline and couldn't believe it wasn't time for lunch already. Wait another 45 minutes and enjoy the scenery I was told. Once we got near the beach, lunch would be served. So we all settled again on the top deck, gazing out to the horizon. And there, at the very edges, was a hint of sky.